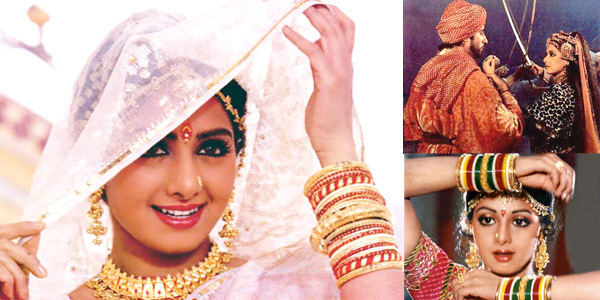 Raaga.com: Sridevi held such a regime in Bollywood that she dared to decline big banner films! Sridevi held such a regime in Bollywood that she dared to decline big banner films! Kisi ke haath na aayegi yeh ladki…. This song from Sridevi’s film CHALBAAZ aptly suits to define Bollywood’s most beautiful and talented actress Sridevi because from Mithun Chakraborty to Jeetendra none could win her and she went on to become Mrs. Boney Kapoor. In the 80’s Sridevi was at peak of her career hence she rejected insignificant roles caring a damn for big banners too. Among the many filmmakers include the king among all Yash Chopra. The younger generation will be surprised to know that not once but twice Sridevi declined Yash Chopra as Sridevi being a ‘Star’ insisted only on playing roles that exploited her talent. Hence when Yash Chopra offered her VIJAY (1988) Sridevi declined because the movie was dominated by many stars like Rajesh Khanna, Hema Malini, Anil Kapoor, Rishi Kapoor, Sonam etc. and her role was insignificant. She even rejected Yash Choppra’s DARR (1993) reasoning the movie was an out and out Shah Rukh Khan film and she did not wanted to end up as a glamour doll. What is surprising is that Yash Chopra instead of getting annoyed respected her opinion and when he had author backed role in CHANDNI and LAMHE, he approached Sridevi and she obliged. Besides Yash Chopra, Sridevi even declined Shashi Kapoor’s mega budget fantasy drama opposite superstar Amitabh Bachchan in AJOOBA (1991). There was a big flutter in the media but Sridevi maintained that until she has a productive role she would not do a film caring little even if it had superstar Amitabh Bachchan! Interestingly when she got a power packed role opposite Amitabh Bachchan in KHUDA GAWAH (1993) she agreed and proved her histrionics by winning Best Actress Filmfare nomination. Other big banner films which Sridevi rejected include Dev Anand’s SACHCHE KA BOL BALA (1989) and Rakesh Roshan’s KHUDGARZ (1987), Lata Mangeshkar produced and Gulzar directed LEKIN (1991).